This post has already been read 23566 times! KEARNEY – UNK is in the Top 10 again. U.S. News and World Report’s 2019 Rankings: Top Public Regional Universities places University of Nebraska at Kearney at 10th in Regional Universities Midwest in Top Public Schools. The annual rankings were released today. Among all regional universities (public and private) UNK improved over last year’s ranking, to 53rd, up from 64th. The magazine’s rankings are based on a formula that uses mostly objective measures of academic quality, such as graduation rates, social mobility, faculty information and admissions data. About 20 percent is based on academic reputation, determined by a peer assessment from top academic administrators at colleges and from high school counselors. UNK’s freshman retention rate of 81 percent is the highest reported compared to its athletic conference piers (ranging from 52 percent to 74 percent), and its graduation rate of 61 percent also compares favorably to MIAA conference schools, averaging 39 percent. Those indicators, combined with small class sizes, student-to-faculty ratio (14:1) and academic quality of incoming freshmen, contribute to the ranking. UNK’s peer assessment score is 2.8 of 5 in the report. Average peer assessment scores for MIAA peers is 2.5. 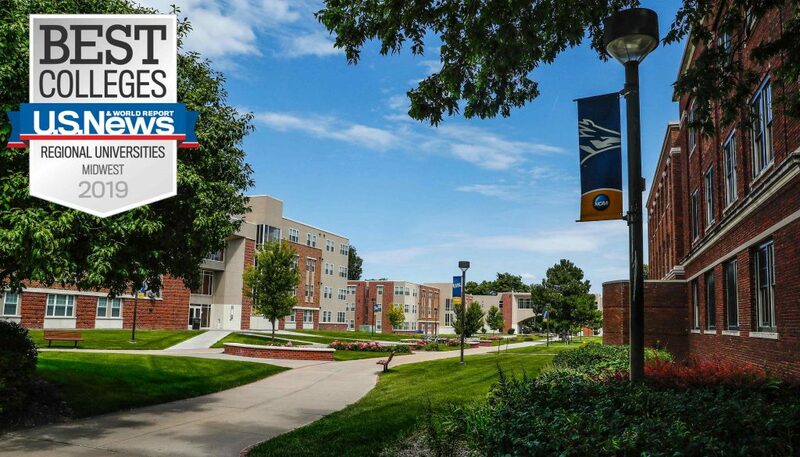 UNK was also listed among “Best Value Schools,” at number 47 in Midwest regional universities. That list examines total cost minus grants, and the proportion of students receiving need-based grants.